The First Lady spoke to U.S. mayors about her initiative "Let's Move! Cities, Towns and Counties" in an event held at the Eisenhower Executive Office Building on Wednesday. For the appearance, Mrs. O wore a Laura Smalls dress, previously seen at the Democratic National Convention in September 2012, here. Black patent pumps completed the look. The first lady is in the audience for the final night of the Democratic National Convention, with the president due to speak later this evening. For the occasion, Mrs. O is wearing a full-skirt, bateau neckline dress in a perfect-for-fall eggplant hue print. An Alexis Bittar lucite dogwood pin at the neckline completes the look. Update: Mrs. O wears a dress by designer Laura Smalls. The first lady wore a dress by Smalls earlier in the week, seen here. What a wonderful moment for the rising designer! Smalls says, "I could not believe my eyes that Michelle Obama wore our dress to this historic event. Words cannot describe how my team and I feel." The First Lady has another full day at the Democratic National Convention, attending the African American Caucus and Hispanic Caucus meetings, as well as a luncheon for the Human Rights Campaign and Gay and Lesbian Victory Fund. 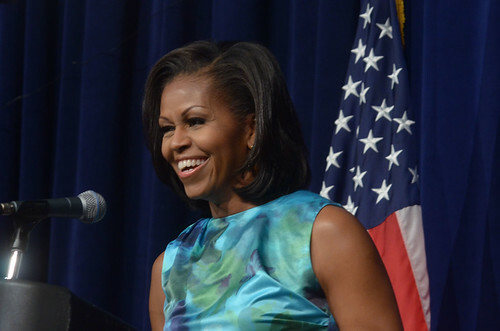 For the appearances, Mrs. O wore a watercolor floral blue sheath dress gathered at the right shoulder seam. Gorgeous! Update: The "soft turquoise watercolored print" sheath dress is the work of designer Laura Smalls. Mrs. O added Laura Smalls to her style repertoire in May 2011, seen here. The President and First Lady held a Cinco de Mayo reception in the East Room of the White House yesterday. On the fashion front, Mrs. O paired a Fall 2010 dress by Laura Smalls with a belt by Alexander McQueen.